Appropriate for beginning soloists, unison classroom singing, and elementary choral groups. This budget-stretching publication is designed to support the teaching of basic singing skills. 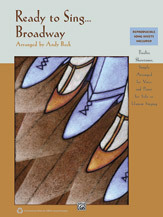 Includes reproducible song sheets. Titles: Forty-Second Street * Give My Regards to Broadway * Heart * How Lucky You Are * Hushabye Mountain * If I Only Had a Brain * It's Possible * Lullaby of Broadway * Round Shouldered Man * Shy * Try to Remember * Wouldn't It Be Loverly.